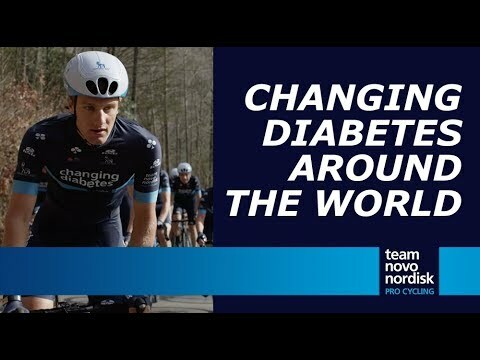 Team Novo Nordisk exists to show the world that living with diabetes doesn’t have to stop you from being incredible. We use cycling as a platform because it’s one of the toughest endurance sports in the world, and one that competes globally. We’re an international group of 16 riders from 10 countries. Because diabetes is a global family. Last year I raced in Azerbaijan, in Taiwan, in the Emirates, in Estonia. It’s a huge experience for me. What I remember the most was in China. Just before the start, one small kid was pointing at my jersey, and we let him come…he was diabetic, and we took a picture, and his face was just so happy. In my first year as a pro I got to race at the GP de Saguenay and the Tour de Beauce. I think Europeans typically don’t tend to think of North America as the home of cycling, but I think especially in that first stage of Saguenay when you start looking a 300-ft wall you get that it’s going to be a tough day. So I’ve race Tour of Denmark two times now in my career. The Tour of Denmark defintiely feels like a home race. When we’re there I feel like our team stands out. We have more fans than anyone else. The regular spectators…I think 50% of them had some Novo Nordisk branded material. We felt like the most supported team in the peloton and its super special, extra motivation. Makes you want to succeed that little bit more, you know? Racing in Japan Cup was special because it’s somewhere I’ve always wanted to go. The crowds in Japan are amazing. There are so many people there, 5 deep on the whole course. I think someone told me there was around 80,000 people there for the race, so the crowd support is unbelievable. As I got the call-up for stagiaire to the Pro Team, the Elite Championships were being held on the Isle of Man. It was great to be able to race against the biggest riders in Great Britain on home roads. I did the time trial, which started 2-3 miles from my house. And then the race followed the famous TT course. It was just an absolute buzz to race on home roads with support signs on the road. Being around the course was unbelievable. It was just…it was such an experience that will stay with me forever. Looking back the day went fantastic, that last stage in Colorado.I had an objective to get in the breakaway. My attitude heading into the stage was that it didn’t matter what happened, it didn’t matter what scenario was thrown at me. So I definitely took the offense is the best defense policy, got really motivated before the start and made sure I was up at the front, and as soon as the race started I went on the attack. It ended up working out, and I got in that breakaway and got to ride at the front of the bunch for a couple hours. My coach call me and asked if I’m ready for Milan-Remo. I said, I’m ready and I can go. I was very nervous because this race is important, not only in Italy but in the world. Our mission is inspire, educate and empower people affected by diabetes around the world.